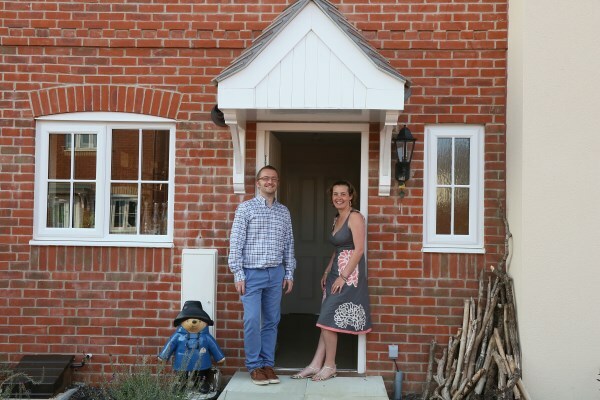 The door to an exciting future has opened for one Romsey couple who have received a very welcome helping hand onto the property ladder. Lorna Apter and her husband Neil were desperate to purchase their own home, having rented in the area for a number of years. And their dreams have finally been realised thanks to Bovis Homes and the Government-backed, low-deposit NewBuy scheme. "We were living in a three bedroom house but had to rent," said Lorna, an office manager. "It really felt like we were throwing away our money. Renting wasn't ideal but it was the only option we had until discovering more about Bovis Homes and this 95% mortgage." NewBuy allows both first-time buyers and existing homeowners to move into a brand new Bovis Home with just a five per cent deposit. "We knew that renting was dead money but it was only when we visited the show home that we realised there was an alternative for us," said Lorna. "Staff at Bovis Homes were extremely friendly and helpful; they told us all about NewBuy and explained that we would only need to raise a five per cent deposit. They talked us through the process, answered all of our questions and gave us clear and concise information to take away and digest." Lorna's mind was already made up - she knew a brand new home was within her reach. "We couldn't believe how simple it was; without NewBuy we would have been renting for another six years," she added. "As soon as we saw the quality of Abbotswood we were amazed and when we discovered more about NewBuy we knew we could make it our home." The stylish new development is located in the picturesque market town of Romsey, combining a wealth of history with modern living. It boasts a variety of attractive properties ranging from small starter homes to larger detached family houses. "From start to finish the customer service received from Bovis Homes has been excellent," said Lorna, aged 37. "The quality of house building was extremely impressive and in addition they were never pushy, providing valuable help with solicitors, mortgage advisors, painters and decorators. We couldn't ask for more - the location, size, impressive customer service; it was perfect."